These three simple questions are an easy way to figure out what works best in your home to help keep your child safe every day. What can my child do now? In the first years of life, children are constantly changing and developing new skills. It is important to think about what your child may be able to do based on their stage of development. Asking yourself this question helps you to focus on the new actions your child can do, such as grabbing, reaching, crawling, walking and more. So what can hurt my child? With every new skill your child develops there may be a new danger. These dangers can put your child at risk for many different injuries. Being able to find possible dangers allows you to think ahead and check your home for any risks. The first step is to get down to your child’s level. Your child’s level is everything they can see or touch while lying, sitting, standing or climbing. So take time to get down on the ground and look around to see the world through your child’s eyes. Are there any things that can poison or burn your child? Can your child fall off any furniture? Now what can I do to keep my child safe? Children can use furniture to climb out the window and fall. Make sure that furniture such as cribs, change tables, or dressers are not placed by a window. Place smoke alarms and carbon monoxide detectors on every level of the home and outside all bedrooms. Change batteries twice a year at daylight saving time so that they are always working. A child can get third degree burns from hot water in seconds. Reduce tap water temperature on the hot water tank to 49°C (120°F). It will still be hot enough to shower and will protect your child’s skin. 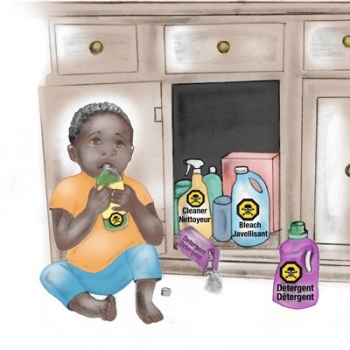 Your child can be poisoned by common items found in the home such as prescriptions, over the counter medicines, vitamins, plants, alcohol, makeup and cleaning supplies. Always keep these items locked up and out of reach. Post the Ontario Poison Centre number by the phone: 1-800-268-9017. Call right away if you think your child has been poisoned. My child can roll from tummy to back, and back to tummy. My child could get hurt if they fall from places like change tables and couches. Before your baby can roll over they can wiggle and move their arms and legs. Always keep a hand on your baby when they are on a high surface such as a change table, bed, or couch to keep them from falling off. To learn more about child safety, click here to sign-up for free injury prevention emails. The views expressed on this site are the views of a combination of organizations and do not necessarily reflect those of Public Health Ontario or the Ontario Neurotrauma Foundation.